Northwood Thin Rib vases are swung vases. They come in two sizes: standard size and midsize. As with all swung vases, the size of a vase is determined by the diameter of its base. Standard size Thin Ribs have base diameters ranging from just over 3.25 to 3.75 inches; midsize base diameters are 4.75 inches. Why do standard size Northwood Thin Ribs have so many different base diameters? That’s because they were very popular—the first ads for the pattern appeared in 1909, the pattern was still being produced in 1925 when the company folded. Multiple moulds were needed through the years to meet the demand for these vases. With so many different moulds, how can a vase with thin ribs be positively identified as a Northwood Thin Rib? Count the ribs. All standard size Northwood Thin Rib vases have nine ribs. 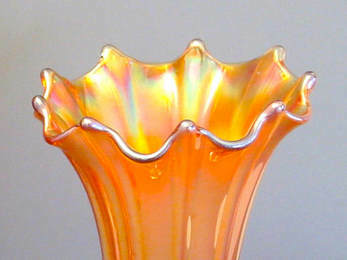 They are the only classic carnival vase with nine ribs. As with all carnival patterns requiring multiple moulds for the same shape, the moulds were not absolutely identical. (Six different moulds have been identified for Grape and Cable punch cups.) Here are a few of the variations used in Northwood Thin Rib vases. 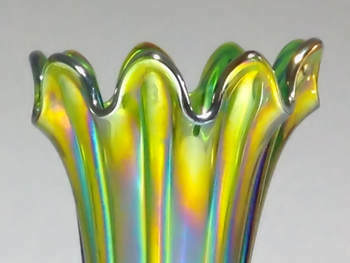 Still other vases have 18 ​distinct scallops. ​As well as multiple moulds for the vases, there were also multiple ring caps that created the tops. The same rings caps were not always used with the same moulds. ​protrude beyond the top of the vase. Still on others, the ribs don't reach the top. On others, the ribs come right to the top. ​then squared-off ends on the spaces between the ribs. ​Some people feel that all Northwood Thin Ribs with 18 scallops around the base should be given a different pattern name—Thin and Wide Rib. 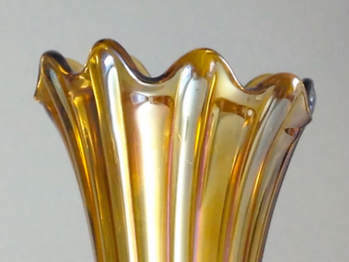 Other people feel that pattern name should be used only if the vase also has the top (above right) with the squared-off ends on the spaces between the ribs. Besides not conforming to carnival pattern-naming conventions (patterns with multiple moulds for the same shapes use “Variant” with the pattern name when a distinction needs to be made) it seems to do nothing but add an unnecessary layer of confusion. Thin rib vases are difficult enough to identify. Why make them unnecessarily complicated? ​A Jester’s Cap is a very different top treatment than a Jack-in-the-Pulpit, where one side is pulled down, with the other side up. 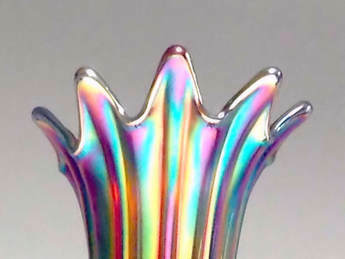 The Jester’s Cap was a uniquely Northwood vase top treatment. A few standard size Tree Trunks can be found with Jester’s Caps. Northwood midsize Thin Rib vases have eight ribs and are usually about 12 to 14 inches tall. ​Unswung midsize vases are called jardinieres and are usually about 6.5 inches tall.